At The Tipsy Goat, we love making your wedding as sweet and original as you! 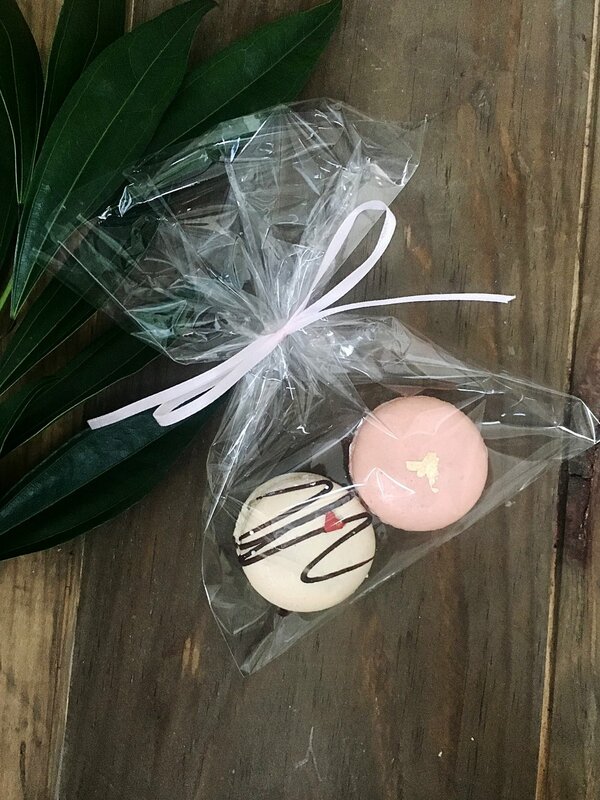 Our macarons can be custom colored to match your wedding scheme, and we're always open to any unique flavor suggestions you may have to truly make your wedding one-of-a-kind. All macarons are $2 each, unless otherwise stated. When you order 100 or more macarons, the price drops to $1.75 each. Prices may vary depending on packaging, detail, and flavor. Special packaging for wedding favors includes cellophane bags or clear boxes, and adds on an additional cost of roughly $0.50-$2.00 per favor. Click here for more info! We require a minimum order of 50 macarons per flavor and color. Please give us at least 14 days notice prior to your event. Payment must be made in full no later than 14 days prior to your event. We believe your special day should be stress-free. Let us take care of delivery and set up! Delivery is $10 for the first 10 miles from our location, plus $1.50 for each additional mile, up to 20 miles. Additional charges apply after 20 miles. You are also welcome to pick up your order from us at The Baker’s Hub in Chesterfield, MO. Want to make a statement? Our Mac Tower holds roughly 240 macarons on ten tiers, however tiers can be removed if you don't need quite that many macarons. A $100 deposit is required to rent the stand, with a reimbursement of $75 when the stand is returned to our kitchen within a designated time, and is inspected by a Tipsy Goat team member to assure no damages have occurred. We are also happy to lend you platters for extra macs, if needed. Below are six of our most popular and crowd-pleasing flavors that we highly recommend for weddings. a St. Louis classic, turned mac! cream cheese gooey butter filling is a fun way to show off this iconic local dessert, especially for those from out of town! cheesecake filling with crushed oreos? yes, please! You can find more flavors on our "Special Orders" page, and we are always open to any fun flavor ideas you may have!